Inclusiveness, sustainability, tolerance, – such common catchwords these days. Words most of us more or less want to subscribe to, at least in theory. On the 4th of May you can participate in a fun and well thought out event that celebrates all these principles: Vienna´s 12th Diversity Ball on 4 May 2019. 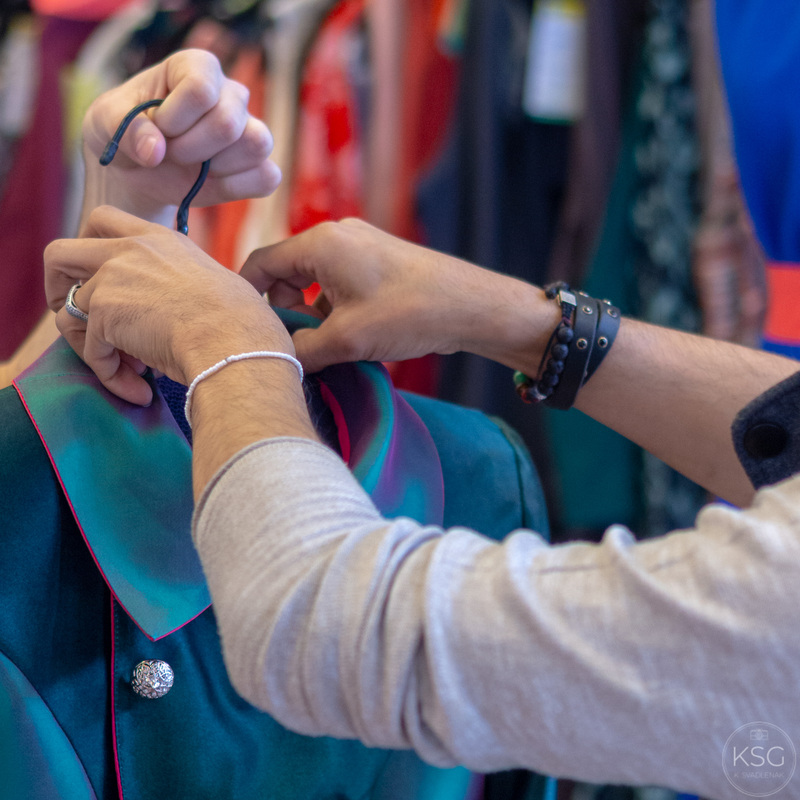 Yesterday I was invited to a little gathering of bloggers and instagramersaustria to see first hand how old stuff can be turned into fancy new outfits. This year´s motto: Maskerade (masquerade). Costume balls are especially fun, I think. Nothing suitable in your closet (though anything goes)? Why not head over to a Humana shop near you and upcycle something into a fancy (or not so fancy) outfit? What could be more sustainable and affordable? Plus, when you shop at Humana, you are supporting not only sustainability, by re-using something instead of buying something new, but also support social projects in Africa and elsewhere. Can you imagine swirling about on the dance floor in a wheelchair? Or when you´re blind? Or deaf? What if you want to come in drag? Or what if you just want to mingle with people from all walks of life? At Vienna´s Diversity Ball you can. The Diversity Ball is the only one of its kind in the world. The aim is to create a cosmopolitan culture of diversity in which we allow each other to be as we are: colorful, advocating for tolerance, accessibility and mutual respect for all. No matter what gender, age, religion or origin, or whether you are living with a physical challenge. The Diversity Ball is uniquely designed to allow access for everyone. It is wheelchair accessible, and it takes great care to allow visually and/or hearing impaired people to safely enjoy the ball experience. For example, “Communication Angels” flit about to support visitors who need it in communication and orientation – listening, speaking and seeing. They translate in Austrian sign language, can show the way to the info point or to the barrier-free toilets. The original idea 12 years ago was a ball focused on deaf people. Equalizent, a company that supports people who are deaf and hard of hearing, as well as people with other disabilities, with access to education and employment came up with the idea. From there it expanded to an all-inclusive ball concept. 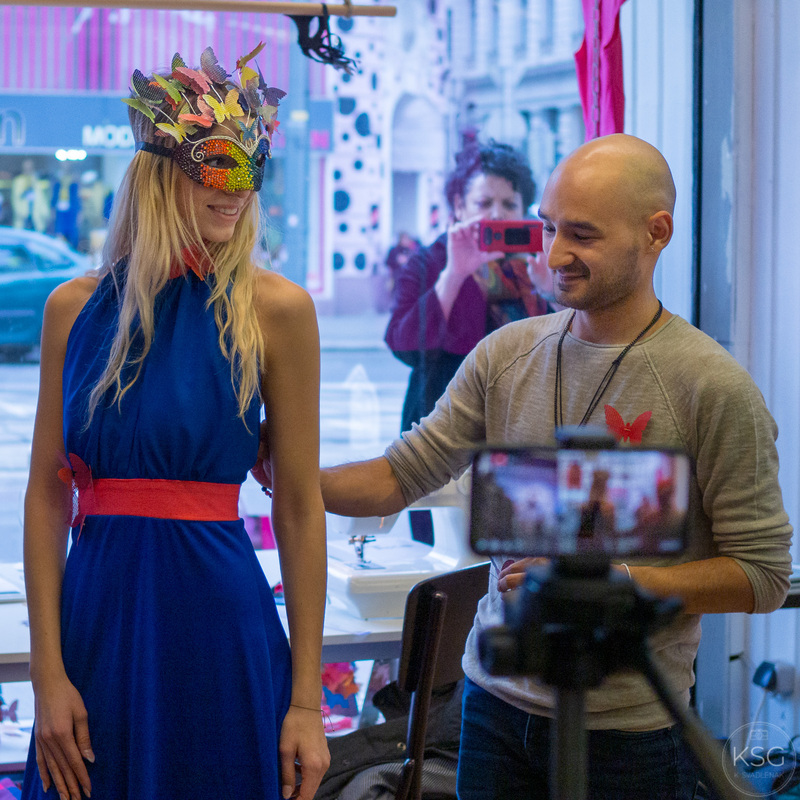 Here Khusen is putting the finishing touches on a dress he put together for model Laura Zöhrer, who is wearing a mask made by @fabulously_flamingocorn. Khusen Khydarov is a young fashion designer from Tajikistan and has been living in Vienna for four years now. He came here to escape prejudice and persecution of homosexuality in his home country. 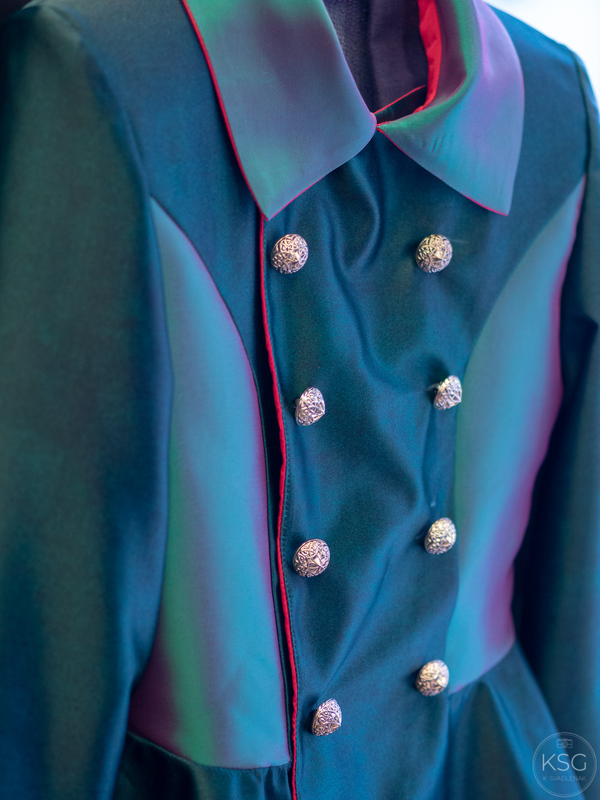 He has already brought out two fashion collections in Vienna and uses unusual materials such as newspaper to create innovative sustainable designs. He tries to combine traditional Central Asian elements with Western European styles. If you want to know more, there is a nice magazine article about this young man´s work here (in German). The organizers of the Diversity Ball did not partner with Humana by accident. 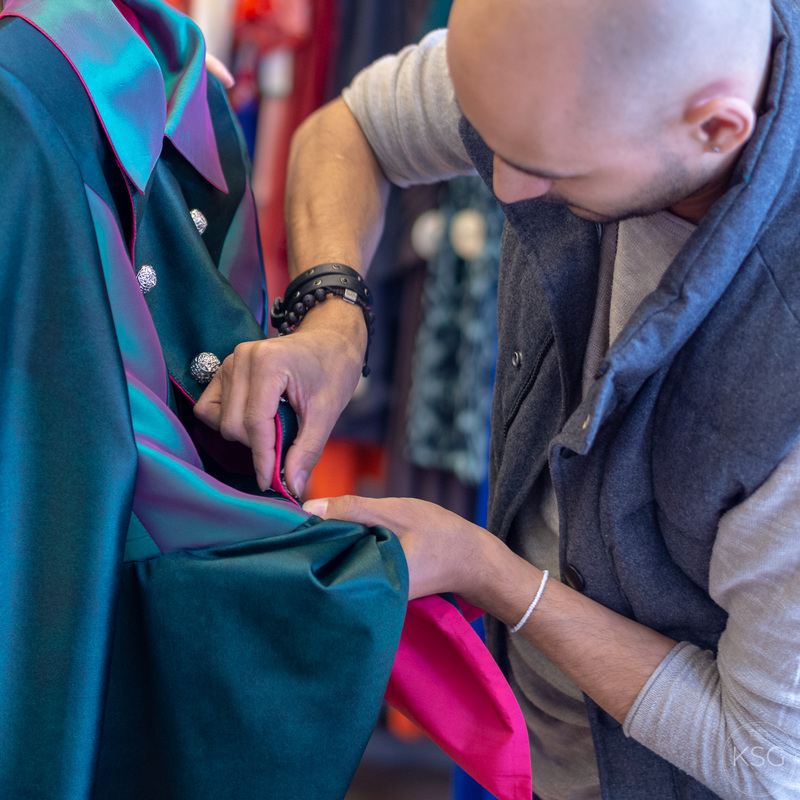 The idea is that if you do not have a suitable outfit and maybe do not have a lot of money or just want to support upcycling for environmental reasons, you can find your costume/gown/suit at one of the many Humana shops for a very low price. How about some golden shoes? Or a dress with embroidered sleeves? Want to win a free ticket? How about a photo competition? Take a look at the diversity ball butterfly in the showcase of SignTime (Schottenring 33, 1010 Vienna) or in the showcase of equalizent (Obere Augartenstraße 20, 1020 Vienna). Post the picture on Instagram with the hashtags # EXPRESSYOURSELF19 and #DIVERSITYBALL and win a ball ticket. You can find the competition conditions here. All proceeds are for charity. This year they will be used to finance further education courses for deaf refugees and projects for the integration of children with disabilities into mainstream education. So go and get your tickets for the 4th of May! Prices are purposely moderate to allow people of lower income to attend the ball as well. Further information at the Diversity Ball website. You can also look at some photos from last year´s ball. The Diversity Ball makes it clear: even if we are all different and unique, there is much that unites us. Now that is something I can subscribe to.